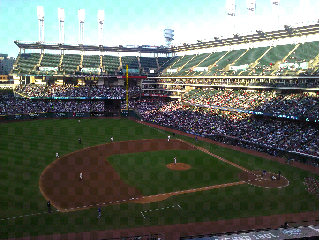 CST contributors Doug and Tom are reporting live from the Indians social suite at Progressive Field. A chill wind blows through the stadium, but we're barely feeling it as we look down at the riff raff below from our lofty perch. Kidding! Thanks to the Indians for including two members of our growing blog into their social media campaign.